Long before the Hogwarts Express pulled out of Platform 9 3/4, magical goings-on were already afoot at at King’s Cross station. It’s true. 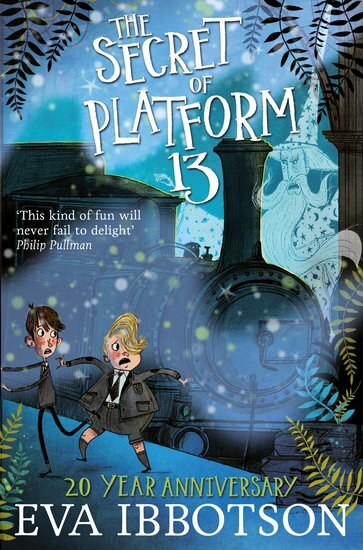 Under Platform 13, a secret door leads to a magical island; a door which only opens every nine years. Last time it opened, the island’s baby prince was stolen and lost on the streets of London. Now a peculiar rescue party, led by a wizard and an ogre, must find him and bring him back. But their long-lost prince has become a spoilt rich boy who doesn’t believe in magic. How can they take him back home? Perhaps you’d like to go in his place? Eva Ibbotson is the award-winning author of many books including Journey to the River Sea. Eva has twice been awarded the Smarties Book Prize, for Journey to the River Sea and The Star of Kazan, and was awarded the Independent Bookseller’s Book Prize for One Dog and His Boy in 2012.